Two of Australia's most interesting, charismatic and unique artists are touring together in November 2018! Both sitting at various points on the spectrum of "prog", the bands The Omnific & Osaka Punch are joining forces to say, in the words of He-Man - "BY THE POWER OF THALL, I HAVE THE PROG POWAHHHH!" November 2018 will see them play in Melbourne at The Evelyn on the 10th, Brisbane at The Zoo on the 16th and the Sunshine Coast's SolBar on the 17th. Joining the two bands on the shows will be Terrestrials & Slow Talk (Melbourne), Sum of Us (Brisbane) and Muules (Sunshine Coast). Add to that, the single tour is in celebration of a brand new single from The Omnific, entitled Erin. The new track was produced by band member Toby Peterson-Stewart and then mixed by Forrester Savell (Dead Letter Circus, Cog, Karnivool) and mastered by Ermin Hamidovic of Systematic Productions, with additional programming by Jamie Marinos. A filmclip will follow for the complex, intricate and intimate track, closer to the tour dates. Toby Peterson-Stewart, one of the bassists for the group, said that "The inspiration for Erin came from being admitted to hospital and needing a creative outlet to cope with the stress and boredom. The story is entirely interpretive as the music can represent a variety of aspects in life." The Omnific is a progressive instrumental band from Melbourne, Australia featuring two bass players and a drummer. Two EPs deep and a new single on the way in October 2018, the band has attracted immense interest from all corners of the globe. The young trio has established working relationships with reputable companies Darkglass Electronics, Neural DSP and Ernie Ball Music Man, seeing them represent the brands with performances at the Melbourne Guitar Show, bringing attention amongst the ‘Gear-Nerd’ community. Coupled with their online play-thru, gear demo and music videos, the band’s reach is beyond what many would expect from this impressive Melbourne trio so early in their career. Over the last nine years, Osaka Punch has forged a reputation as one of Australia’s most wildly entertaining live acts. The group’s distinctive fusion of catchy grooves, jazz chops and a rock ethos sets them apart from most heavy acts and allows an element of humour and satire in an otherwise very serious scene. Reviewers have been keen to emphasise the crowd-captivating live antics of both the outfit and it’s charismatic and ceaselessly energetic front man, Jack ‘Muzak’ Venables. 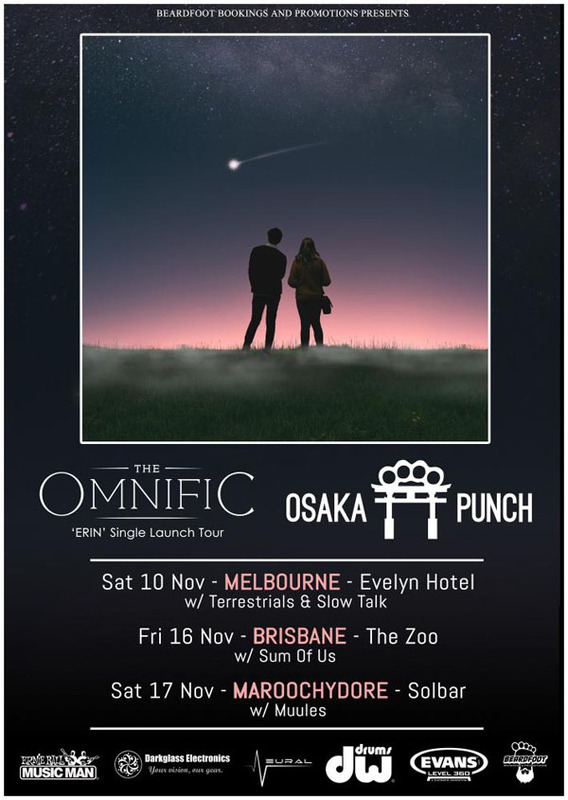 2018 has proven to be life on the road for Osaka Punch having hit the road with The Butterfly Effect, Mammal and festival dates alongside The Living End, Frenzal Rhomb, Spiderbait & Polaris, showing that the Brisbane lads can grind it out with the best of them. Having toured Australia, the UK and Scandinavia, Osaka Punch has honed their live set to a fine art. This, combined with well-crafted songs and world class musicianship, makes Osaka Punch one of Australia’s must see live acts. Tickets on sale now from Oztix.